The eyewitness who saw this sighting described the UFO as a dark ghost-like object. 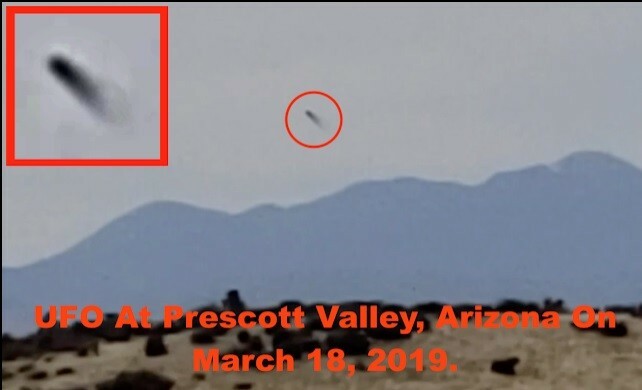 However, popular extraterrestrial researcher Scott C Waring who analyzed the clip revealed that this dark object could be actually an alien spaceship. Waring also added that this UFO is partly cloaked, and suggested that aliens might be living in a base that would be about 4-5 miles below the ground. "Look closely at this UFO and you will see its partly cloaked. What looks like smoke, is actually the hidden parts of the ship becoming visible. This UFO either just came out or was about to enter an alien base that would be about 4-5 miles below the ground. That is the only possibility for an alien craft to be hovering in a desolate location for so long. There are a lot of aliens that prefer the dryer hotter climate like the tall greys, the short greys, and the tall whites," wrote Scott C Waring on his website UFO Sightings Daily. The website post made by Scott C Waring soon became the debating point among conspiracy theorists, and many people outlandishly confirmed that this incident is authentic proof of alien existence. Some of these people argued that aliens used to visit the earth for hundreds of thousands of years to monitor human activities. A section of conspiracy theorists alleged a foul play by NASA, and they claimed that the United States space agency is intentionally covering up realities of alien life fearing public panic. The news of this UFO sighting comes just a few days after another square-shaped black flying object was spotted in California. In the footage uploaded to YouTube by a user named Daniel Zermeno, a square object was seen moving slowly across the skies. Interestingly, the UFO in the video can be seen spinning in the air at regular intervals.